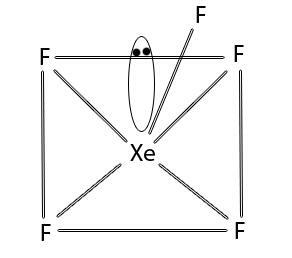 The important fluorides of xenon are xenon difluoride(XeF2), Xenon tetrafluoride(Xef4) and xenon hexafluoride. It is prepared by heating a mixture of Xenon and fluorine in the ration 2:1 at 400 degree Celsius and 1 bar pressure in a sealed nickel tube. XeF2 undergoes hydrolysis when treated with water an d evolves oxygen. In XeF2, Xenon is sp3d hybridised and the molecule has linear structure as shown. It is prepared by heating a mixture of Xe and F2 in the molecular ratio 1:5 at 400 degree Celsius and 6 atm in a sealed nickel tube. 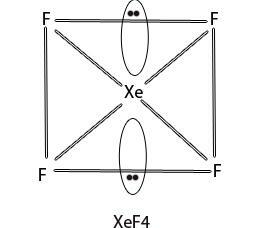 In XeF4, Xenon is in sp3d2 hybridised state and has square planar geometry. It is prepared by heating a mixture of xenon and fluorine in the ration 1:20 at 300 degree Celsius and 60 atm in a nicked vessel. XeF6 Undergoes slow hydrolysis with atmospheric moisture producing highly explosive XeO3. XeF6 molecule possesses distorted octahedral structure. 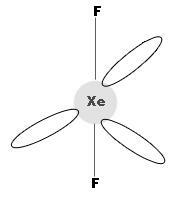 The Xe atom in XeF6 is in sp3d3 hybridisation.